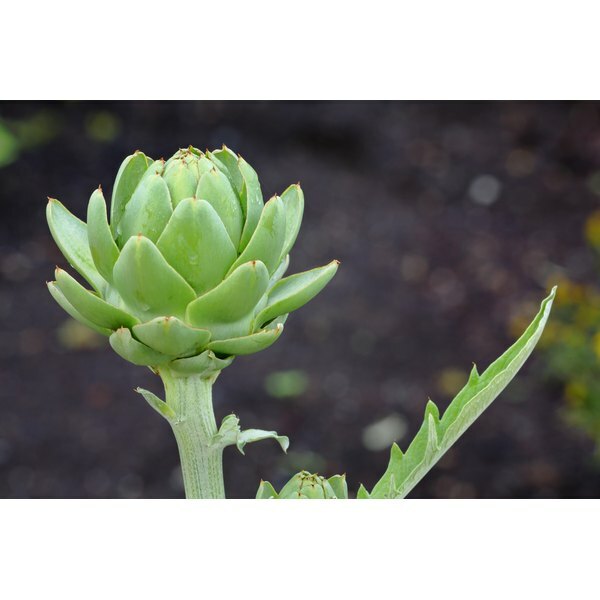 Artichoke extract is actually made from the leaves of the artichoke plant, the ones that grow along the stem, rather than the flower buds of the globe-like vegetable. While it has traditionally been used to stimulate the kidneys and increase bile production in the liver, artichoke leaf is more commonly used today to treat gastrointestinal disorders, and it may also help regulate blood cholesterol levels. Dyspepsia, sometimes simply called indigestion, is characterized by symptoms of bloating, low appetite, nausea, and possibly diarrhea or constipation. An article published in “Alimentary Pharmacology and Therapy” in 2003 reported on a large-scale six-week study in which people suffering from functional dyspepsia saw improved symptoms and quality of life after taking 320 milligrams of artichoke extract. Finding that dyspepsia symptoms were greatly improved when compared to the control group, researchers concluded that artichoke extract could help improve the symptoms of those suffering from dyspepsia. An article published in February 2013 in the “International Journal of Food Sciences and Nutrition” discussed a study that found that a 250-milligram dose of artichoke extract could help regulate blood cholesterol levels. In the study, conducted on 92 human subjects over eight weeks, researchers found that total cholesterol levels were lowered, and that levels of low-density lipoprotein, or LDL, cholesterol, which contributes to the build up of plaque in the arteries, were also lowered. Researchers also found a significant rise in levels of high-density lipoprotein, or HDL, cholesterol, which can help improve arterial health. This led them to conclude that artichoke extract may help manage mild levels of high cholesterol. A study reported in “Biological and Pharmaceutical Health” in 2010 found that the rate of healing in rats with digestive tract injuries increased after they were given artichoke extract. Researchers found that dosages between 125 and 500 milligrams of artichoke extract per kilogram of body weight led to improved mucous health in the gastric lining. The effects of the extract were seen in healthy subjects as well as those suffering from stress-related injuries. While the results are promising, researchers indicate that further study is needed on dosage and efficacy in humans before artichoke extract can be recommended as a potential treatment for ulcers or other digestive-tract problems. Artichoke extract comes in different concentrations, but it is most commonly consumed after being added to teas, soups and water. If you cannot find artichoke extract, you can also make artichoke leaf tea, or consume up to 6 grams of dried artichoke leaves a day. However you take it, you should spread your consumption out during the day. While there are no significant side effects, the safety of artichoke leaf has still not been thoroughly studied. The NYU Langone Medical Center recommends that pregnant and nursing women should avoid it, as should those with severe liver or kidney disease. If you are considering taking artichoke leaf extract, talk to your doctor about it first.